I’m just over three months into my posting at the Ministry of Justice Digital Services, and – to put it simply – I’m a convert. The work has been challenging, rewarding and very exciting, allowing me to experience the cutting edge of digital government. I’m now product manager of the Digital Capability Project, which is part of a broader piece of work on raising digital capability across the MOJ (for which we’re recruiting a Head - see below for details). The Digital Capability Project is about transforming the way we work in the Ministry of Justice. It’s about continuing to improve the efficiency and pace at which government can deliver, to create better outcomes for the citizen. As a civil servant myself, who’s worked in both policy and operational roles, I know that policy-makers and frontline staff do excellent work, and I believe that the modern tools and techniques out there are an incredible opportunity for us to offer even more. Raising the digital capability of a department needs some defining, and we’ve done so by setting out five principles of digital capability, covering culture and mindset, task management, as well as digital tools. We’ve blogged about the principles. We’re focusing on the first two principles to start off with. 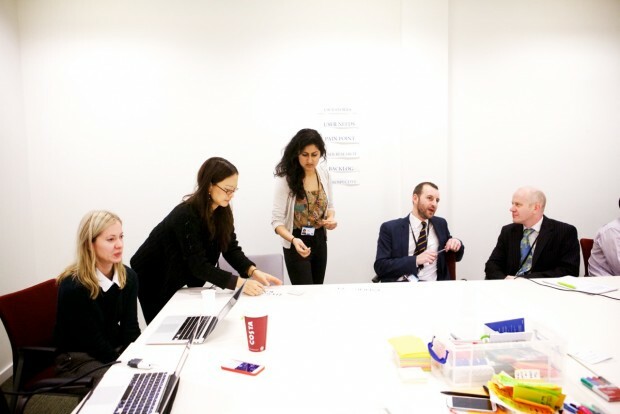 User-focused, iterative ways of working come under the umbrella of ‘agile’, and we’ve found that there’s been a huge level of demand for digital training of this kind from the rest of the department. That’s demand right from the top, as part of the Civil Service Reform Plan, as well as ground-up from teams throughout MOJ. Through the Digital Capability Project, we want to develop a training offer that meets this need, and that has been tested out with our users at every step on the way. The road hasn’t been straightforward, and we’ve encountered a number of key challenges as we’ve begun prototyping our interventions. Merging two totally different working cultures and practices isn’t easy, and in an age where teams raise concerns about being regularly accosted by new management fads, we’ve had our fair share of sceptics. Feedback received early on meant that we’ve worked very hard to recognise that policy and operations face very different challenges and parameters to digital products. While MOJ DS has been very successful in applying user-focused, agile ways of working to build excellent digital public services, these need to be adapted to ensure the best results for the rest of the civil service. And so we’ve been testing bespoke workshops, working with teams to create in-depth user personas of their stakeholders that they can use to make their internal processes more responsive and effective. We’ve sought to understand learning needs and preferences, and have experimented with new ways of ‘learning by doing’. This worked incredibly well in our recent seminar series, where participants took a user needs problem that they’d identified and resolved it as an agile project over three days of lunch time sessions. MOJ is a huge and disparate organisation, and we need to cater for a wide range of people and teams. We’ve relished these challenges, seeing them as an opportunity to get even more creative, and resolving them by coming up with some truly innovative ways in which to raise digital capability. For example, from next week we’re beginning a virtual agile coaching experiment with the Legal Aid Agency in Newcastle. Our successes have been recognised, and we’ve had support for what we’re doing from senior leaders such as the Digital Leaders Network, where we presented in December. We will also be presenting at the Open Policy Making event series at the Cabinet Office, as well as to more groups throughout MOJ. I’ve loved working here over the last few months - the momentum around Digital Capability is speeding up, and the team have been awesome. The potential for MOJ is huge and the impact could be phenomenal, with policies and services that are smarter and more responsive to the needs of the user. Applications for the Head of Digital Capability close on Monday 29th January. If there is anyone you know who you think would be great for the role or if you’re interested in applying yourself, please see the job advert for more details. Really interesting - especially to read about the workshops and seminars and what's worked well to introduce people to these principles. Once people have done their introductory training and are converts to the benefits of digital capability, do you have an offer to help them embed it into their day-to-day work? Yep, that's ultimately the plan - we're hoping that once we've made our final assessment of what went well and what went less well from the prototype workshops/seminars/coaching that we've run so far, we'll be in a position to decide on the shape of the 'digital capability programme'. That programme will be a cohesive package that incorporates introductory training with longer term support in embedding the new styles of working. Great to hear more about how MoJ is tackling digital capability. Have you reached conclusions yet on what the interventions will look like? There's some potentially big behaviour changes in the 5 principles of digital capability - look forward to hearing your experiences of what works to tackle those. We're getting there! I'm hoping that by the end of February we'll have reached the end of our 'Alpha' stage of prototyping and iterating interventions, and will have decided what we're going to pursue and in what form. Then, the plan is to test that out again, but this time at scale in 'Beta'. Of course, we'll keep iterating and reassessing to ensure that the eventual intervention package is the one that most meets the needs of the department.